in Beans and lentils, North Indian recipes, Punjabi cuisine, Veg. 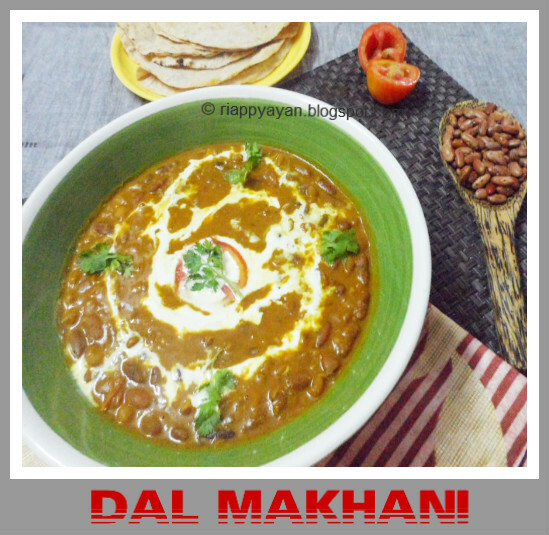 Dal Makhani, a flavourful lentil preparation also Known as Maa Ki Dal or Kali Dal, a celebrated delicacy from the Indian state of Punjab. Rich, creamy lentils cooked with very few but assorted spices, makes it one of the best warm and soul foods ever! Dal (lentil) Makhani (cream/butter) as the name insists is filled with calories and is a special treat. Traditionally, the dal/lentils are simmered overnight in Tandoor or cooked on low flame to enhance the taste and as the recipe name insists, the lentils are cooked in Ghee(ghee/clarified butter, other than it has more calories than regular oil, it has a lot of good influence on our body, according to Ayurveda). Whenever I cook this I try to reduce ghee and butter as much as I can to make it healthier and also I never add cream expect I am cooking for a party. A low calorie version is also available. Replace Butter with oil and cream with 2% milk. Cooking it for a long time, makes it rich tasting and creamier without the cream and butter. Rajma/red kidney beans : 2 tblsp. Cumin seeds : 1 tsp. Ginger-garlic paste : 1 tblsp. Coriander Powder : 1 tsp. Garam masala powder : 2 tsp. Dried fenugreek leaves(kasuri methi) : 1 tsp. 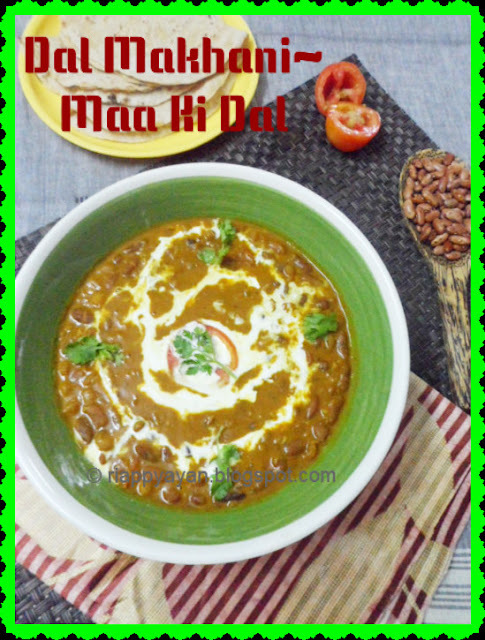 Soak whole urad dal and rajma overnight in enough water. Next day before cooking pressure cook the dals/lentils with a pinch of both salt and turmeric powder. Cook until both lentils are thoroughly cooked. Mash lentils well with the back of ladle and keep aside. Note : store the excess water for later use. Now, heat butter or oil in a pan. When hot, temper with bayleaf, whole garam masalas, slitted green chillies and cumin seeds. When seeds crackle, add ginger-garlic paste and onion. In Medium flame, stir fry the onions until lightly browned. Add red chilli powder, coriander powder and garam masala powder. Tip: If you don't want to add butter at this point, you can drop a teaspoon of butter on the dal while serving. Mix the spices well and add reserved lentil water and cook until oil seperates. Add chopped tomatoes or tomato puree and cook further. Add dried fenugreek leaves or kasuri methi now and mix well. Add mashed lentil and mix with the tomato puree. Add salt to taste and in low flame let it cook for 10-15 minutes, so that lentils can soak all the spices. After 10-12 minutes, add cream or milk and lower the flame to low. Cook for another 5 minutes, then remove from heat. Serve with any Indian bread, like chapati, naan or paratha. Goes well with lightly seasoned Pulao also. Labels: Beans and lentils, North Indian recipes, Punjabi cuisine, Veg. Looks yum.. A true tasty & healthy fud ! Hi, I am Indrani, the Writer, photographer and admin of this blog. If you wish to work with me, then drop me a mail at riappyayan@gmail.com. Thank you for visiting my blog.